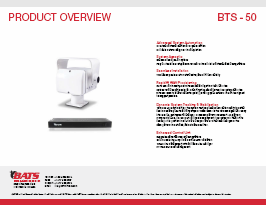 The BTS 50 is a purpose-built microwave stabilization system designed for systems featuring up to 2FT antennas. Ideal for deployments requiring a small footprint, the BTS 50 represents a flexible solution for operators looking for reliable Line-of-Sight (LoS) communications in a small, modular package. The BTS 50 System is a quick deployable, automated tracking and stabilization system. Positioned for payload torque of up to 50 ft lb and antennas up to 2FT, the BTS 50 provides BATS’ tested light payload for organizations in need of a mobile point-to-point (PTP) broadband communication link. This modular system is ideal for both fixed, nomadic, and mobile terrestrial and nautical applications. Where temporary communications is needed, response teams will have the ability to quickly deploy and configure high-speed, high-capacity wireless networks.